Juan Domingo Perón (October 8, 1895 – July 1, 1974) was an Argentine general and politician. He was born in Buenos Aires. 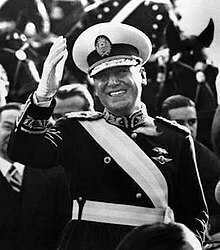 He served as President of Argentina from 1946 to 1955, ruling with Eva and again from 1973 to 1974 with his wife Isabel, who was his vice president. In Argentina, he and his second wife Eva or Evita are considered icons by many people, especially members of Peronist party, which he started and is still popular today. He was elected in 1946. In 1955 he was overthrown and force to leave the country. In 1973, he returned and ran for President again with his third wife Isabel as Vice-President and was elected. He died in Buenos Aires less than a year after being elected. His widow, Isabel took his place, which made the first woman to be the head of a country's government in the Western hemisphere. He was very popular among the working class because he was the first politician in a long time to care about the Argentine people. He required businesses to pay decent wages and safe conditions. He also did other social reforms, but also was pretty controlling. He controlled what could be said over the radio and sent people opposing him to jail. He also controlled unions and businesses, so although they had power, the government had last word. This page was last changed on 2 April 2018, at 19:01.